When on vacation from The Work (his quatuor with Tim Hodgkinson, Bill Gilonis, and Rick Wilson), Mick Hobbs gathered friends and allies to play music under the Officer! banner. This tape was released on french label AYAA (then called AAA). The label was launched 1982 with the legendary ‘Douze Pour Un’ compilation LP. This cassette is an awesome collection of rock songs, some deeply haunting, some rough at the edges. Songwriting is top-notch, the kind of sad tunes or grotesque anthems that are hard to forget once you’ve heard them. Some songs were recorded at Cold Storage with help from This Heat members who also helped with the production of Officer!’s ‘Ossification’ 1984 LP, also on AYAA. The line-up is varied, contributing to multifarious musical ideas and inventive arrangements. All members of The Work contribute here as well. Hobbs and ex-Family Fodder Alig Pearce formed the duo Lo Yo Yo, releasing an LP in 1985. Additionally, Felix Fiedorowicz was a member of Family Fodder as well (1979-1988, reformed 2002). Richard Wolfson (1955-2005) was the creator of the ambitious 1993 Towering Inferno’s ‘Kaddish’ show and CD to which Hodgkinson and Cutler also contributed. 12 pages hi res booklet w/ drawings, lyrics and info attached with download file. 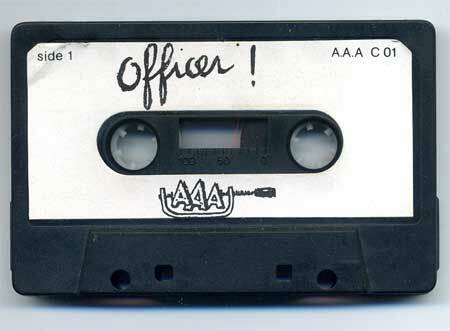 [On a side note, I also have Officer!’s ‘Cough’ cassette, if someone is interested – it’s a 1985 live recording made in France]. Thanks for putting up this wonderful tape. I still have my own copy but haven’t had a tape player for some time now so it’s been years since I’ve been able to enjoy these strange, sad songs. I’d love to hear “Cough” too, if that’s possible. Thanks for commenting, Robert. I’ll post ‘Cough’ in the following weeks, then. Thank you so much for this one. A real gem ! Officer’s Ossification LP is one of my favourite record in the RIO style. So I’m very glad to have this cassette recording now, thanks to you. Thanks for your comment. I will work on the ‘Cough’ cassette next month. A friend of mine is a longtime fan of anything Mick Hobbs and sent me a disc with most everything by Officer, including an obscure release called Bandagen, but not this 8 Songs cassette. I’ll have to let him know about this, in case he doesn’t have it. I played on the l.p way back when.